Servicing Chatham-Kent, Sarnia- Lampton, Windsor-Essex, London- Middlesex . The septic tank and leach or drain field were developed in the late 1800’s.Today there are just over three quarters of Canadian use septic systems to manage gray water and black water for their homes and businesses. As more people who are unfamiliar with septic systems move out to unsewered rural communities, the potential for septic system failures increases. What follows is a guide to give you a basic understanding of how septic systems work and what it takes for successful septic system installation and use. Wastewater consists of graywater which is typically generated from wash water used in sinks, washing machines and showers, and blackwater which includes human waste from toilets. The average person produces about 50 to 75 gallons of wastewater per day . it includes organic and inorganic materials—solids—as well as microorganisms such as viruses and bacteria. Direct discharge of wastewater results in a public health hazard. The majority of homes not connected to a municipal waste system use septic tanks to remove solids and greases, and leach fields, or other types of soil absorption systems for wastewater disposal to protect the environment. In most areas public health departments manage or control approval for these systems. In the past, wastewater management for homes consisted of cesspools which are buried bottomless containers. This ultimately allows solids and liquids to get directly into the soil and potentially contaminate surface water and groundwater. Septic tanks are watertight containers, installed between the house and fields, that remove solids and grease, provide anaerobic digestion of the solids, and storage of the sludge and scum. Bacteria and viruses are not readily controlled by septic tanks. Septic tanks today are typically constructed of concrete or fiberglass. They are designed to have solids settle in the tank and digested by anaerobic bacteria. The gases produced in this process are vented from the septic tank through the household plumbing vents. Non-biodegradable and inorganic materials aren’t digested by the microorganisms, and accumulate as sludge or scum layers. These sludge and scum layers must be removed periodically as part of a regular maintenance regimen. Appliances like washing machines, dishwashers, and garbage disposals increase the amount of sludge, and requiring more frequent service. Wastevwater from the septic tank generally flows by gravity into a leach or drain field. This effluent is absorbed by soil particles and the dissolved organic material is removed by bacteria which live in the top ten feet of the soil. As the effluent drains through the soil, the temperature and chemical makeup of the wastewater changes creating a hostile environment for bacteria and viruses. So as the wastewater percolates downward through the soil, organic material and microorganisms are naturally removed and the water eventually enters the groundwater aquifer. A portion of the wastewater does move toward the surface and evaporates or is absorbed by plants. ​​If you notice seepage on the ground, or when household plumbing becomes clogged, it is likely that the septic system is failing. While it could be the septic tank, it is normally the drain field that fails. The most frequent cause of sewage ponding on the ground or clogging of household plumbing is reduction of soil percolation rates. As the drain field ages, a bacterial slime mat grows in the soil under the trench. This mat functions as part of the wastewater treatment process, however, it also reduces the percolation rate. Percolation rates are also reduced by solids which flow from septic tanks that have not been pumped and by flooding due to high groundwater or sewage flowing from neighboring leach fields. If water doesn’t drain from showers and toilets, or if you have water that “ponds” over the drain field, the tank should be pumped. This is also part of normal maintenance which is a good preventive practice. If there is an effluent filter in your system that also may need to be cleaned. You could also have roots that are blocking the pipes, there could be too much water running into the system, groundwater may be elevated, or damage could have occurred from heavy vehicles that causes excessive soil compaction. In virtually all of these cases it is best to contact us so we can assess the actual cause and determine the best way to solve the problem. Other problems can occur from improper installation or if there are changes to the property from construction or even rodent activity. If there are excessive slopes, a fracture in the bedrock, or a cut is made too close to the system it could require relocation of the drain field. One issue that isn’t a tank or field problem is odors that occur from the system. It is possible that local weather conditions can temporarily prevent proper odor dispersion. If there is excessive odor from the house vents it may be necessary to increase the height of the vent to facilitate proper dispersion. Septic tanks and leach fields that are properly designed and constructed do require regular maintenance. 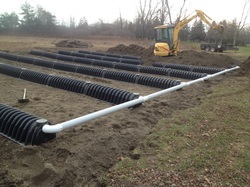 Maintenance of the septic system consists of removing sludge accumulation on a regular basis. We recommend an inspection every three years.The septic tank should be pumped when the bottom of the scum layer is within three inches of the bottom of the outlet pipe. While there is some variation according to the tank size this is a good rule of thumb for most systems. Never construct leach fields close to another leach field. Drain fields that are too close together will both fail. 1. Septic systems never need replacement. designed, installed, and maintained drain field requires replacement once every 15 to 30 years. This is no different from household appliances. 2. Regular use of commercial lye products will clean your plumbing and tank. Lye essentially kills the bacteria that digest solids in the septic tank. It has the reverse effect and will require more frequent pumping. 3. Flushing yeast or buttermilk into the septic tank eliminates the need for pumping. It is common practice to flush additional organic material into septic tanks, particularly for systems that are used infrequently like vacation homes. must still be pumped periodically to prevent solids from clogging the drain field. 4. If the septic system appears to be failing, flush the septic tank with large amounts of water. 5. Washing machine wash and rinse water should be discharged to the ground surface to protect the drain field. Washing machine water contains bacteria removed from clothes and can contaminate surface streams. Soap residue will also clog soil pores and can kill plants. Water from the washing machine should be treated and disposed of in the same manner as water from sinks and showers. 6. My septic system is healthy because the grass is bright green over the drain area. A bright green drain field area may be a sign that the effluent is not leaching through the soil. Check for any ponding in the drain field.
" Marc is a real professional and knows his stuff. I've used him regularly for the past several years and he's very thorough and knowledgeable about septic systems. Makes excellent recommendations to help prolong the life of your septic system. Great personality and willing to go the extra mile. Highly recommended".